A person with cancer may have blood with an unusually low level of platelets. This condition is called thrombocytopenia. Platelets are made in the bone marrow. Bone marrow is the soft, spongy tissue found inside larger bones. Platelets, also called thrombocytes, stop bleeding by helping clot blood and plugging damaged blood vessels. The body does not make enough platelets. This side effect is common in people with cancer, especially for those receiving chemotherapy. Managing symptoms, which can include thrombocytopenia, is an important part of cancer care and treatment. This is called palliative care or supportive care. Talk with your health care team about any symptoms you or the person you are caring for experience. People with thrombocytopenia may also notice it is difficult to stop nosebleeds or bleeding from a cut. Tell your health care team right away if you have any of these symptoms. Often, you will not have symptoms until platelet levels are very low. Many people find out they have thrombocytopenia from a blood test before symptoms occur. Chemotherapy. Some types of chemotherapy damage bone marrow. This lowers the production of platelets. But this condition is usually temporary. It is rare that chemotherapy permanently damages bone marrow cells. Antibodies attack platelets. The body makes certain proteins called antibodies. They destroy substances that appear harmful to the body, such as bacteria and viruses. But sometimes the body makes antibodies that destroy healthy platelets. A large amount of radiation therapy is directed at the pelvis. The patient is receiving chemotherapy at the same time. Certain types of cancer. Cancer cells, such as leukemia or lymphoma cells, crowd out normal bone marrow cells. Cancer that spreads to the bone. Prostate or breast cancer that spreads to the bone may cause this condition. When cancer is in the bone, it may be hard for the bone marrow to make platelets. Spleen cancer. Excess platelets are stored in the spleen. Spleen cancer may cause the spleen to enlarge. This traps too many platelets. People are diagnosed with thrombocytopenia by a blood test. This test is called a platelet count. It counts the number of platelets in a sample of blood. People with certain types of cancer or those receiving a type of cancer treatment known to cause thrombocytopenia have regular blood tests to look for blood-related complications. Treatment for people receiving chemotherapy. People whose platelet counts drop may be able to switch to a lower chemotherapy dose. Or they may wait longer between treatment cycles. Also, some people may receive a drug called oprelvekin (Neumega). It helps prevent severe thrombocytopenia. Treatment for people having cancer surgery. The doctor may delay surgery until platelet counts return to normal. This lowers the risk of heavy bleeding. Meanwhile, people with low platelet levels may receive a transfusion of platelet cells. This prevents unplanned and heavy bleeding. However, transfused platelets only last about 3 days. And some people may need multiple transfusions. Typically, these platelets do not last as long in people who have received many transfusions. Ask your doctor before drinking alcohol or taking new medications. These can make bleeding problems worse. Use an extra soft toothbrush. And do not floss if your gums bleed. Blow your nose gently using a soft tissue. Be careful when using scissors, knives, needles, or other sharp tools. Take steps to prevent burns while cooking. Avoid contact sports and other activities that might cause injury. Use a nail file with rounded ends instead of a clipper when grooming fingernails and toenails. 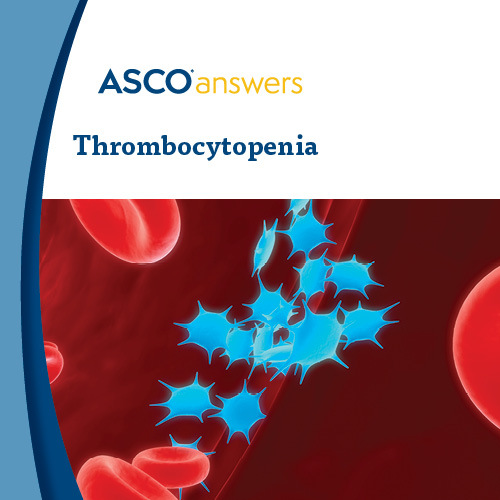 Download ASCO's free Thrombocytopenia fact sheet. This 1-page printable PDF introduction to thrombocytopenia includes possible causes, symptoms, how it is diagnosed, treatment options, words to know, and questions to ask the health care team. Order printed copies of this fact sheet from the ASCO University Bookstore.